This ECG is taken from an elderly woman with chest pressure radiating to left shoulder for 30 minutes. She also complained of nausea with vomiting. Her family offered a history of unspecified cardiac disease, hypertension, hypercholesterolemia, and dementia. The ECG shows ST elevation in Leads I and aVL, with reciprocal ST depression in Leads III and aVF. ST segments have an abnormally flat shape in Leads aVL, II, III, aVF, V5 and V6. She was admitted to the hospital and sent to the cath lab. 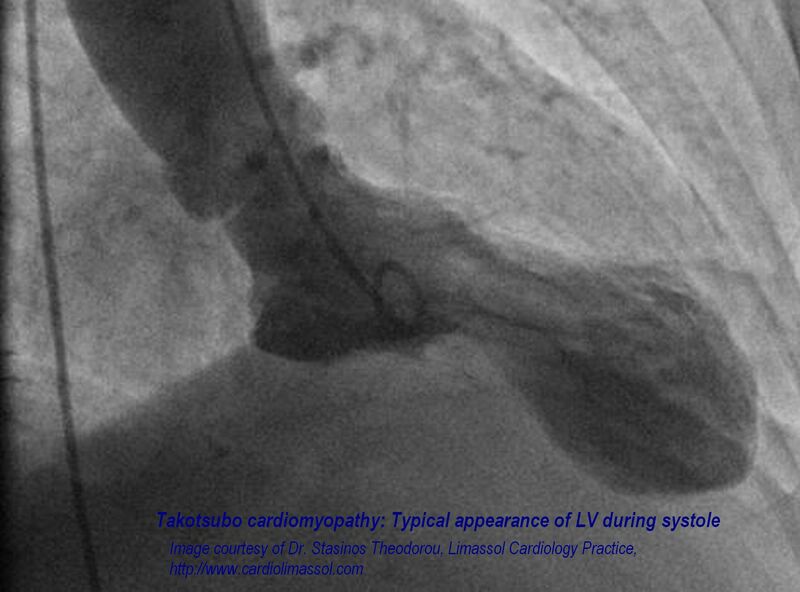 Her arteries were found to be clear, and Takotsubo cardiomyopathy was diagnosed. See also. Our thanks to Lew Steinberg and Palm Beach Gardens Fire Rescue for donating this interesting ECG.